The Airplane – Our ADV Cessna 206 is one of the best skydiving airplanes in the blue skies. It’s in exceptional condition and is regularly serviced by the best maintenance company in Croatia. Our 206 also has an array of modifications which make it fly safer, climb faster and more comfortable than comparable Cessnas. The Instructors – Every one of our ADV instructors has over 15 years of experience in skydiving and thousands of skydives. They also own numerous skydiving licences, including from the USPA (United States Parachute Association). Their number one priority during tandem skydiving is your safety. They’ll make sure you feel as comfortable, relaxed and safe as possible. The Parachutes – As with the airplane and the instructors, the parachutes we use for tandem skydiving are the best of the best. All of our four tandem parachutes are from the most reliable, safe and experienced manufacturers on the market. The parachutes are regularly checked and packed by our own professional packer. The Altitude, Speed and Free-fall – You’ll jump out of the airplane (with your instructor behind you) when you reach an altitude of 3000 meters or almost 10.000 feet. 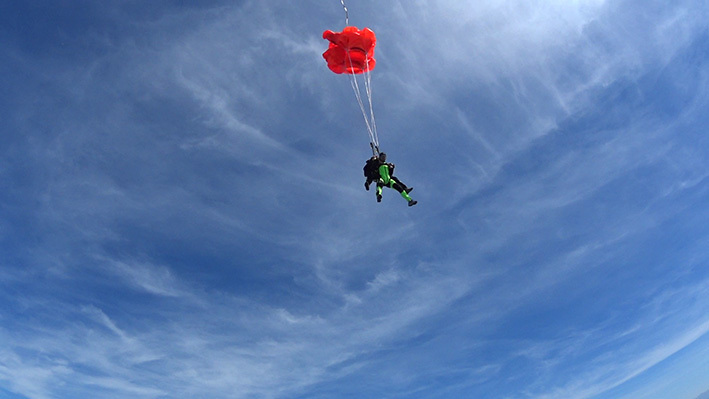 The free-fall part of your tandem skydive lasts around 45 seconds but can last a few seconds longer. The speeds you’ll reach during free-fall will be around 200 km/h or 125 mph. The Location – Our dropzone, located in the seaside village of Rtina near Zadar, is considered to be one of the most beautiful in Europe. But don’t take our word for it – you’ll decide for yourself. Depending on conditions, you’ll free-fall directly above the mesmerizing blue sea and land mere meters from a beautiful sandy beach. We hope you’ve enjoyed reading about the 5 most interesting facts about tandem skydiving… If you need any additional information, give us a call or read this. We’re looking forward to jumping with you soon!